5 races, 1 win, placed twice and 1.161.810 FF. Winner of the Prix des Gobelins, important maiden. 2nd Prix de Jockey-Club Lancia (gr.1). 6th Budweiser Irish Derby (gr.1). Retired to stud since 1993. 1996 - 2000 : 93 wins, 301 places, 8 293 200 FF. 37 wins and 3 995 609 FF, abroad. MAJINSKAIA, Prix des Tuileries (L), 2nd Prix de Psyché (Gr.3). 1999 : MARIGNAN 's first crops show a great aptitude in jumping races, illustrated by SCOUT MASTER, brilliant winner of Grand Steeple-Chase de Villeurbanne (120 000 FF - 20,5 f) and Prix de Beaune at Enghien (200 000 FF - hurdles) or N'AVOUE JAMAIS, 3 wins at Auteuil including Prix de Chambly (200 000 FF - 15 f) and 2nd Prix Roger de Minvielle (st. - 17 f). 2000 : N'AVOUE JAMAIS, 4th Prix de Longchamp (Gr.3), wins the important Grande Course de Haies d'Eté des 4 Ans (Gr.1) at Auteuil. SCOUT MASTER wins for the second time in a row the Prix de Beaune at Enghien (270 000 FF - hurdles), then the new Enghien Prince triumphs in the Grande Course de Haies d'Enghien (Gr.3 - 19 f). 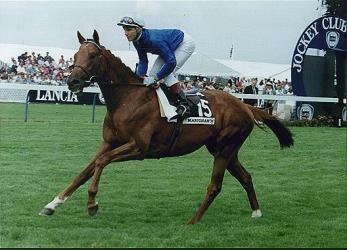 2002 : SCOUT MASTER, dominates the Grand Steeple-Chase de Lyon (Hdp. - 20,5 f). 2005 : Allez Cash is placed second of the Prix Alain et Gilles de Goulaine (h. - L.), at Auteuil. BLUSHING GROOM (1974 - 1992). 10 races, 7 wins (7 groups), placed 3 times. 1.742.000 FF - 16 120 pounds at 2 and 3. Production as a sire since 1978. Total 1981 - 1999 : in GB, 245 wins and 3.412.270 pounds - in the USA, 503 wins and $ 18.984.182 - in France, 203 wins and 37.554.800 FF. Total : 97 SWS ( 56 win. - 123 group races). - MAISON CLOSE. 1 win and 181 000 FF. 2nd Prix d'Automne (L) - 4 wins and $ 134 395. Nassau St. (L). Dam of winners. - CLAUDE MONET (Affirmed). 3 wins. Mecca Dante St. (Gr.2). Sire. - MOONLIGHT DANCE (Alysheba), 2 wins - 480 000 FF. Prix Saint-Alary (Gr.1). - MOON AHEAD (Impressive), 4 wins - $ 21 561. - MOUNT HAGEN (Bold Bidder), 4 wins - 633 885 FF and 7 824 livres. Prix du Moulin de Longchamp (Gr.1), Prix de Fontainebleau (Gr.3), 3rd Sussex Stakes (Gr.1), 3rd Benson and Hedges Gold Cup (Gr.1), 2nd Prix Niel (Gr.3), 3rd Grand Critérium (Gr.1), 4th Poule d'Essai des Poulains (Gr.1). Sire. - MONSANTO (Breton), 5 wins - 447 850 FF and 6 371 livres. Prix de Fontainebleau (Gr.3), Prix du Rond-Point (Gr.3), Prix Ridgway (L), 2nd Irish 2000 Guinées (Gr.1), 2nd Prix Messidor (Gr.3), 3rd Prix du Palais Royal (Gr.3), 3rd Prix Quincey (Gr.3), 4thPoule d'Esai des Poulains (Gr.1), 4th Queen Ann St. (Gr.3). Sire. - MALECITE (Fin Bon), 5 wins - 386 000 FF and 7 512 livres. Prix Messidor (Gr.3), 2nd Prix La Rochette (L), 3rd Prix du Chemin de Fer du Nord (Gr.3), 3rd Prix d'Ispahan (Gr.1), 2nd Doonside Cup (L), 3rd Prince of Wales St. (Gr.2). Sire. - Puzla, 6 wins. 3rd Opa Locka St., 3rd EBF Rochestown St. (L). - MIAMI SANDS, 2 wins - C.L. Weld EBF Park St.(Gr.3), Leopardstown 1000 Guineas Trial St. - In the USA, 2nd San Clemente Hp., 3rd Del Mar Invitational Oaks (Gr.2), 2nd Yerba Buena Hp (Gr.3), 3rd Wilshire Hp. (Gr.2). - MORCOTE, 2 wins - C.L. Weld EBF Park St. (Gr.3), Go and Go EBF Round Tower St. (L), 4th Airlie Coolmore Irish 1000 Guineas (Gr.1). Dam of winners. - Marton, 1 win - 2nd Grand Prix de Bruxelles. - MARTIEN, 2 wins - 266 000 FF. Prix Nimbus (L), 3rd Prix Berteux (Gr.3), 4th Prix de Condé (Gr.3). - Mandragore, placed. Dam of MARIE DE BAYEUX, 4 wins, Coupe des Trois Ans (L.), placed 14 times, 2nd Prix de Flore (Gr.3), The Very One Hdp. (L.) (00), 3rd Yerba Buena Breeders' Cup Hdp (Gr.3) (00). - MUNCIE, 3 wins - 861 450 FF. Prix Saint-Alary (Gr.1), Prix Pénélope (Gr.3), 5th Prix de Diane Hermès (Gr.1). - SUBTLE POWER, 2 wins, King Edward VII St. (Gr.2) and 91 963 pounds. - KRENAKOR 4 wins, Clasico Asociacion Nacional de Criadores (L.), 3rd Clasico Anahuac (L.) in Mexico. - HARDBURLY, 8 wins - $ 300 719. Ellis Park Juvenile St (L), 3rd Alysheba St. (Gr.3). - Near Dark 7 wins, 2nd Patuxent St.
- RINGARO, 2 wins. Flash St., 2nd Youthful St.
- CHASING WIND 3 wins, Windmill St.
- Distant Hill (Tom Fool), placed. 3rd National Stallion Stakes. - Moonmadness (Tom Fool), see above.